RJS Vande Mantram & JaiHind Journalists met to discuss positivity in journalism.Deliberation began with self introduction of India News Today and the inquisitive young – Interns. RJS journalists raised lot of questions related to the media°s career,its working , social security welfare of media person and it’s growth in today’s perspective. Uday Manna the Convener of the group explained the necessity of positive journalism and how to inculcate it’s ethic and values so the society gets inspiration to be better human being.Naresh Sagar RJS Sr member of RJS explain the role of media as an umpire,observer has bird view to find solutions with continuous deliberation among intellectual Thinkers for setting right direction for the society to achieve their Solomon goals and bring day to day changes in the society. Entire deliberation or mini worship started at 2.15 PM lasted UpTo 6.15 PM the India News Today asked to convert the deliberation into the videos for the benefit of media fraternity. Deliberation were shot in questions answer firm as an interview which shall be uploaded as per the schedule of Ajay Pawar who is well versed film direction and took personal interest in making it Video of Chai for baatcheet soon shall be sent to 10K members of ippci ,WJI & RJS. Sagar Media Inc Wishes everyone Happy dawn of Vikram Samvat 2075 Greetings on the auspicious occasions of Ugadi, Gudi Padava and Sajibu Cheiraoba. May this new year bring joy prosperity and happiness to all. Hillary Clinton Broke Wrist: Falls Again On India Trip. The former secretary of state for the United States, Hillary Clinton, could not follow her itinerary in Indian city of Jodhpur as she injured her right hand. According to reports, Hillary injured her hand after slipping in a bathtub at the palace where she was staying in Rajasthan’s Jodhpur city. Doctors, who were called to Umaid Bhawan Palace following the mishap, advised the 70-year-old to rest as they diagnosed her with a sprain. Due to this, Hillary had to cancel her plans to visit the Mehrangarh Fort, which she had lined up for the day. After her visit to the Mehrangarh Fort, Hillary had leave for Salawas village to see weaving of durries (carpets). However, since the pain did not subside, Hillary decided to get her hand checked at Goyal Hospital in Jodhpur where an X-ray of the wrist showed she had a hairline fracture, according to Times of India. This was the second time Hillary fell on her tour of India. Earlier, she was seen stumbling while descending the staircase of Jahaz Mahal, a 13th century harem in Mandu, Madhya Pradesh. It was unclear whether the fall caused injury in Hillary’s hand as she used her right hand to catch herself on the stairs. 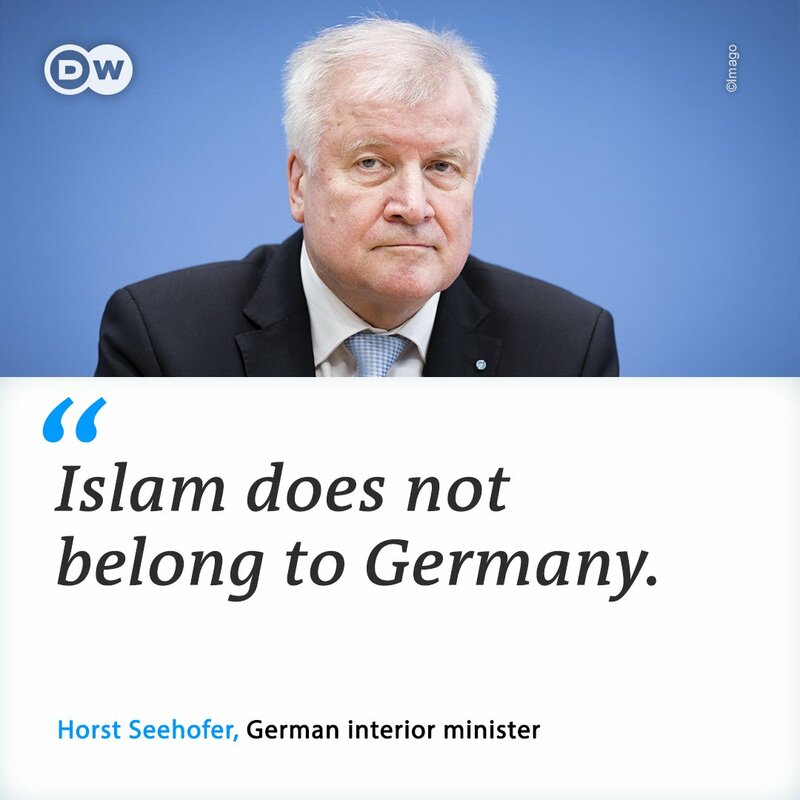 German Chancellor Angela Merkel´s hardline new interior minister declared that Islam is not “part of Germany” in an interview published Friday, setting off a political storm two days into her fourth term. Asked by the top-selling Bild daily whether the influx of Muslim migrants and asylum seekers to Europe´s top economy meant that Islam now belonged to the fabric of the nation, Horst Seehofer replied “no”. Germany´s Muslim community is estimated to count about 4.5 million members, around 1.8 million of whom are German citizens. Seehofer´s provocative comments come just two days after Merkel was sworn in for a fourth term with a new right-left “grand coalition” government. The outspoken Seehofer, leader of the Christian Social Union (CSU), the Bavarian sister party of Merkel´s Christian Democrats, is new to the cabinet. His expanded interior super-ministry also covers “Heimat” or homeland affairs, intended to recapture claims to patriotism and national identity from the far-right AfD, which won nearly 13 percent of the vote in September´s general election. Powerful conservative Wolfgang Schaeuble said in 2006 that Islam was part of Germany and Europe as interior minister in Merkel´s first cabinet, provoking little reaction. Christian Wulff, then president of the country, revived the phrase in 2010, this time touching off a heated national debate, with right-wing conservatives accusing him of denying Germany´s Judeo-Christian roots. Seehofer´s comments are likely to prove divisive in the fledgling coalition, which only came together when the reluctant SPD got on board after months of political paralysis. Juergen Trittin of the opposition Greens sharply criticised Seehofer, saying a stance of exclusion would be “catastrophic” and only benefit the anti-immigration AfD.